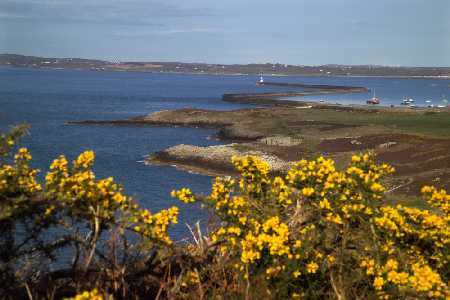 When you have walked the Holyhead Trearddur stretch you will have done the first leg of the Anglesey coastal path route around the island. 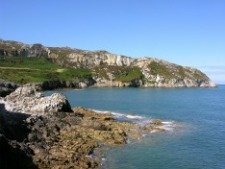 This is a fascinating section starting within the Roman Fort, which encloses the famous St Cybi’s church, then you cover rugged mountain and cliff tops, finally ending your walk near a long, popular sandy beach. 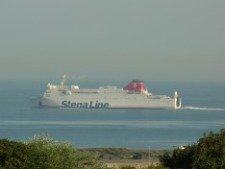 Walk along the main road parallel to the Port of Holyhead, turning left opposite the Marine Hotel onto Prince of Wales Road, which takes you past the Maritime Coastguard Agency station and along Newry beach. 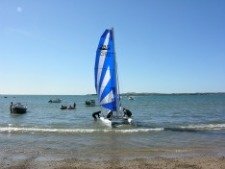 You will see the outer harbour full of yachts, protected from the fierce waves of the Irish Sea by the iconic Holyhead Breakwater. Keep going straight, pass the Trinity Marina and as the road descends and winds, continue until you come to an opening on a rough track, follow the coastal path signs and go down onto the large white pebbled beach to your right. You will now see the outside of the breakwater on your right as you climb the narrow steps that take you to Rocky Coast, the beginning of the designated Area of Outstanding Natural Beauty (AONB). Look north from here and see Skerries Lighthouse on the horizon, about 7 miles away with Carmel Head to the right. On this part of the Holyhead Trearddur section you may see some ponies, recently introduced to help manage the grassy headland. As you meander up the narrow path from the coast you meet a wider track used by off-road vehicles, next to the Holyhead Country park lake. 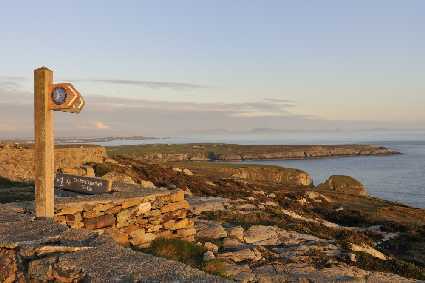 Turn right and after about 25 to 35 metres take the gate on your right, and continue on a winding path towards the cliff edge again, where you find a platform with a panoramic view of Holyhead Bay. The next stretch of undulating terrain is quite demanding and you soon arrive at a dilapidated storeroom previously used for the North Stack Fog Station. Continue along this path, well laid with some flat stones to ease the walk experience, and before long North Stack comes into view in the west. Eventually you come to a junction, at this stage out of site of North Stack, and you will need to turn right. You descend the path all the way to North Stack and do go in and see Philippa Jacobs, who has an Art Gallery on the premises. Take care around the sides of this building as the cliff edge is close, especially if young children are on the walk. Here you can see an amazing view of the huge cavern separating where you stand from the mainland. 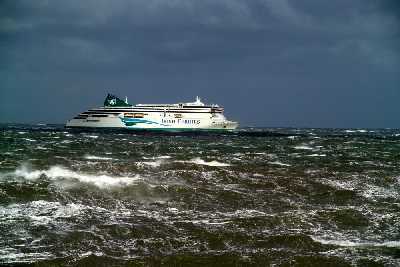 Leaving North Stack go right up the hill with a splendid view of Gogarth Bay and if the time is right you may see the Holyhead Dublin ferry sailing by. 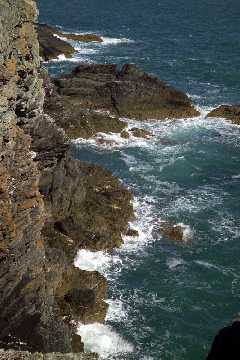 The cliff face along Gogarth Bay is also very popular with climbers who look like small coloured ants dotted over the cliff face of varying grey and brown shades. Next take the right turn when you approach the special coastal path signpost. You will start to feel this part as you rise towards Holyhead Mountain, and then walk through a gap in a stonewall, after which you descend briefly and then rise again. 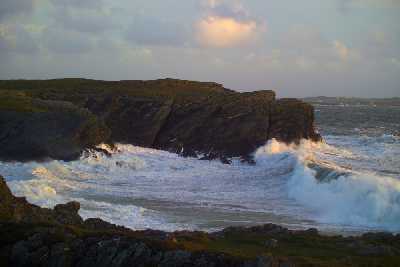 At the junction, turn left for Holyhead Mountain peak, or continue for the Holyhead Trearddur coastal walk, where you will see remains of an old Iron Age hill fort. As you climb down the stone steps westward the path gives way to a gravel track and you pass a disused radio station on your right. Follow the path over an exposed, heather covered, rocky ridge, where the wind can pick up strongly and enjoy breathtaking views. You reach a disused telegraph station right on the cliff edge and below you is a spectacular view of South Stack lighthouse. Leave this high observation point and follow the track down to the road, turn right to descend 400 steps to the lighthouse or left to reach Ellin’s Tower near South Stack cliffs. 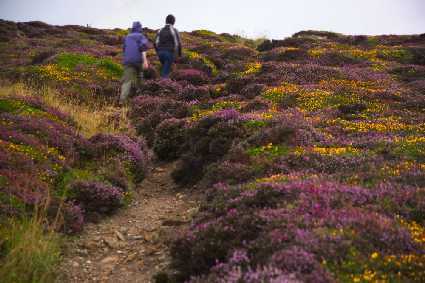 On leaving Ellin’s Tower make your way carefully along the cliff edge path for about 400 metres and then left along a path surrounded by a riot of pink heather and yellow gorse, arriving at the RSPB car park. Take the right turning here down the tarmac road to the T-junction at the bottom of the hill where you’ll see a stile to pick up the path again, which will run parallel with the road to Trearddur Bay. Now continue along the path into an area known as the Range, with fine coastal views from Penrhyn Mawr particularly of South Stack, now to the north of you. 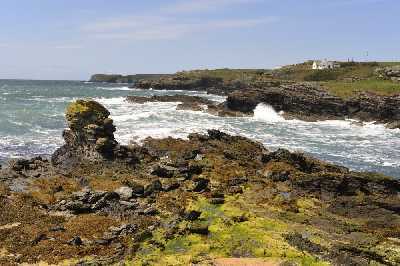 This section has particular beauty for its openness and wide panoramic view and some interesting rock formations around the Dinas stack before you reach Porth Dafarch beach, a location where divers search for gold from wrecked ships sent by Louis XV. 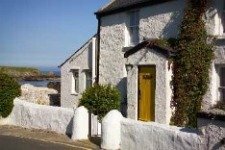 Keep following the special signs as you complete this Holyhead Trearddur leg of the Anglesey Coastal Path, passing through Porth y Post and Porth y Pwll before arriving at a sandy Trearddur Bay beach. Just in time for a nice ice cream. 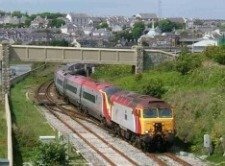 With completion of the 12 mile (19 kilometre) Holyhead Trearddur stretch you have now completed the first leg of 125 miles of Anglesey coastline.